Spring colors, fun textures and a pat work quilt design – the Crochet Sensory Baby Blanket has it all. But don’t let the word Baby stifle your imagination. This blanket would make a wonderful lapghan for anyone. As I sat with this finished blanket on my lap (watching Dr. Who), I stroked the different textures. This blanket will be great for anyone who tends to need something to fidget with. This blanket will most likely be used as my daughter’s play mat. The Crochet Sensory Baby Blanket is a final project from the March Texture Madness Crochet A Long. During the Crochet A Long we learned 9 crochet stitches and had the chance to make small, medium or large sample swatches. The Medium sample swatches we turned into the Crochet Baby Sensory Book, the small samples were used to make the Sensory Block, and the largest sample sizes are used for this blanket. Below you will find links to all the crochet stitch tutorials that are used to make the squares of the blanket. Each tutorial post has a video tutorial as well as the written pattern for the sample swatches. For the blanket you will need to make the large 12 inch sample swatches. This blanket uses the large sample swatches made during the March Texture Madness Crochet A Long. Refer to those Tutorials for Stitches and Abbreviations. All posts linked below. Finished blanket will measure 38″ x 38″ with using 9 squares of texture. Use the patterns for the large sample sizes in the links below to create a total of 9 squares. You can make each side a different stitch, or make a few of your favorite stitches. It is completely up to you. 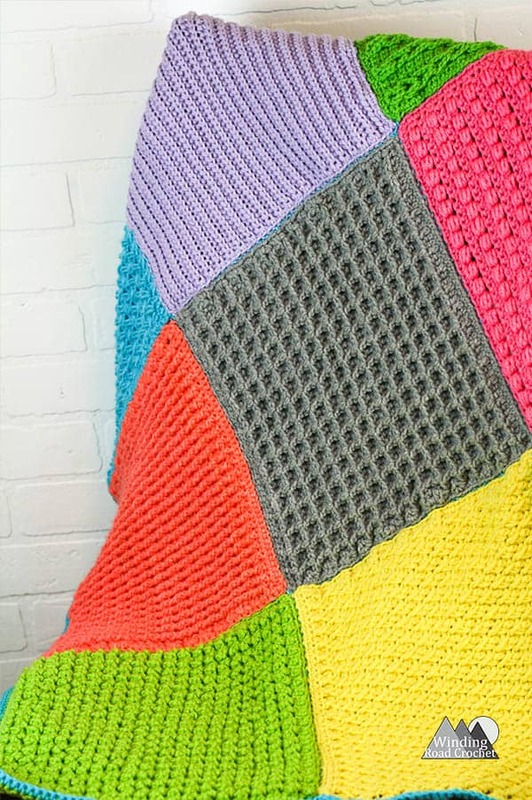 You can also make more squares to make a larger blanket. Before sewing the blanket together it is a good idea to block each side so that it is approximately 12.5″x 12.5″. Lay your squares out on a table or floor and place them in a 3×3 grid. Rearrange them until you like the order they are in. Sew the blocks together using a invisible stitch or whip stitch. If you are unfamiliar with sewing crochet pieces together check out the sewing video below. Be aware that the number of stitches around the edge of each square may not be exactly the same, simply sew them together by lining up the top and bottom of each square and do not try to line up the stitches. To smooth out the edges and add some consistency to the project I added a Single Crochet Border around the edge of the blanket. This is very easy to do if you have been adding Single Crochet borders around every inner square. Slst to any corner, Ch1, *working down the side of the rows, Sc into each st until you reach the Ch1 space at the corner,(Sc, Ch1, Sc) in the Ch1 space in the corner* repeat from *to* a total of 4 times. Slst to your first Sc and fasten off. Weave in all your ends and you blanket is complete. I love the patchwork quilt-like look of this blanket. Are you going to make a Crochet Sensory Baby Blanket? I would really like to see your finished piece, take a picture and share it with me on any social media! Just tag me @windingroadcrochet, #windingroadcrochet, or #ourcrochetjourney. Join my Facebook Group and share your creation with the community at Our Crochet Journey Facebook Group! Written pattern, tutorials, graphs and pdfs of the Crochet Sensory Baby Blanket are copyright Windingroadcrochet.com. Please do not reprint or repost this content as your own, but please feel free to share this link with others. You can find more information on sharing my work with others in the Terms and Conditions Page.